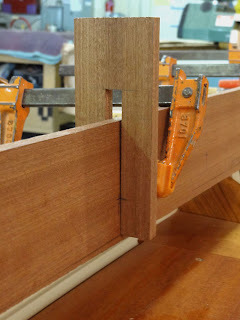 The coamings required some of the trickiest fits yet, short of the frames. The frames were harder, but there was less at stake because they were painted into the boat, whereas the coamings are finished bright. Any misses will be obvious under varnish. Preparation for the decks and coamings began early, and I covered some of this in previous posts. 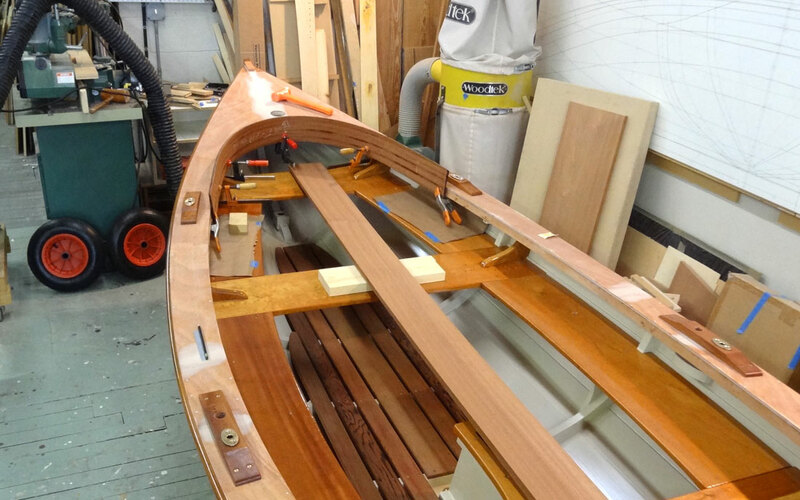 Deck layout was covered in Part 7, and the curved beams and coaming lamination were covered in Part 12. The curved coaming pieces have been hanging up in the shop, waiting for me to get back to them. A brief description of the concept is in order, though. The curved parts at each end are laminated from 7 layers of 1/16" vertical grain sapele veneer. The two straight parts are re-sawn from a 5/4 v.g. 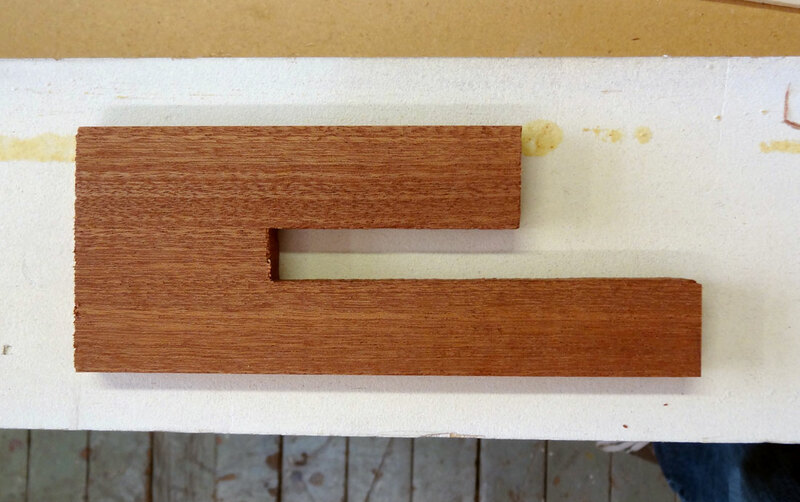 sapele board, to make two sides, and finished to 7/16" to match the curved bits. 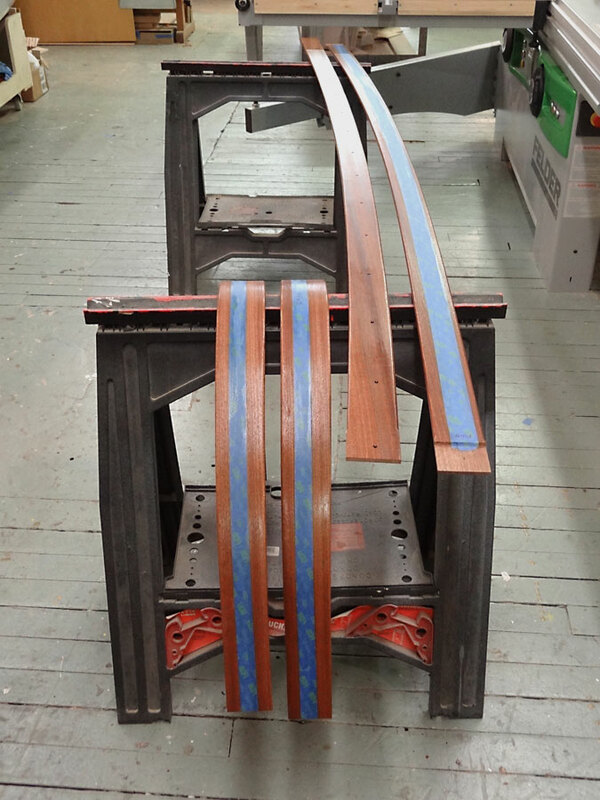 The joins from curved to straight are half lapped, with a joint length of 2". I did not make patterns for any of it, but marked and cut the pieces straight from the boat. The curved pieces were hung with with clamps, and temp. screwed so that they would return to their exact location after cutting. I was only concerned with the end cuts of each piece at first. 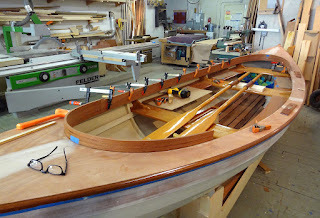 I waited until all pieces were fit and joined before cutting any of it to final width, leaving plenty of room for all the pieces to move up or down to tune the joints. 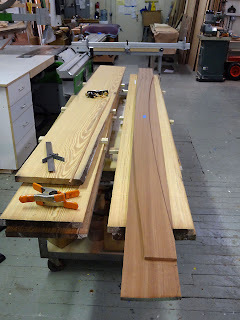 The curved ends are clamped up and marked for cutting. I first decided where I wanted the joins to be, and marked this location on the ends of the curved pieces. I know its fast to make this kind of cut by hand, but I've got a great sliding table saw with all kinds of hold downs only six feet away, so that's how I made the end cuts. I have a great table saw, might as well use it! 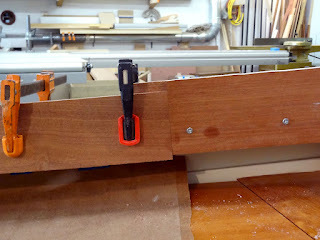 I used a router with a top bearing cutter and scrap mdf for a guide, clamped to the coaming. I hardly ever use this one, but the ancient old vintage Stanley router had the right cutter in the collet already, so I dug it out. This thing is at least 50 or 60 years old, and is fun to look at, plus it works fine. The big wing nut that tightens the motor in the base has never worn out. The D handle Porter Cables all have replacement bolts with nuts because the aluminum wing nuts they come with wear out so quickly. 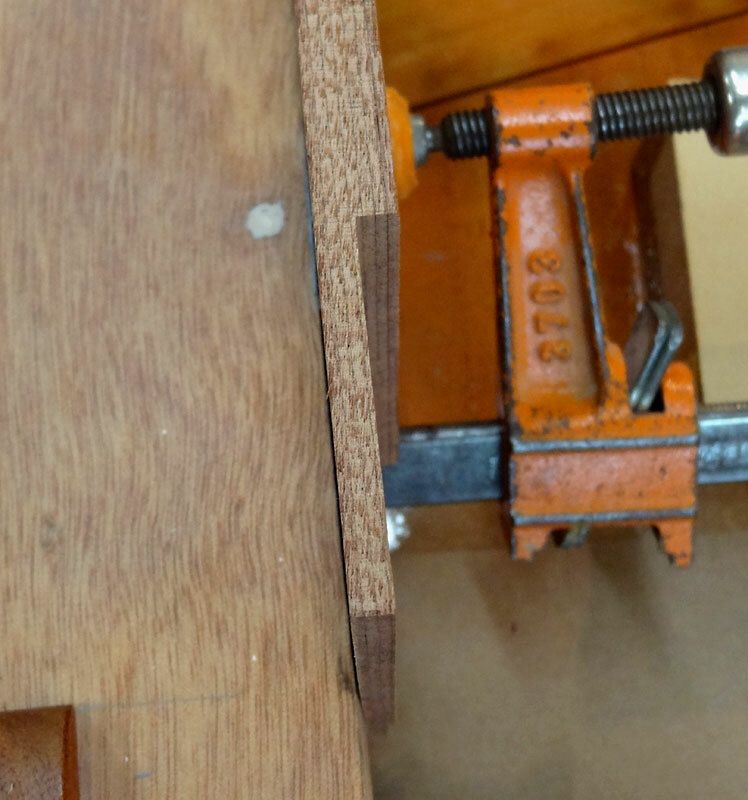 I set the depth a little shy of half way, and tuned the cut with a rabbet plane afterwards. Half way through the center veneer is a handy visual reference for the correct depth of the first half of the joint. These cuts were made fairly quickly, and the coamings hung with temp. screws. The half lap is evident here on the curved end, where it joins to the straight part. If you look close, you can see the cut is half way through the middle veneer layer. I next clamped one of the straight parts in the boat, and roughly marked out the sheer curve and length (left a couple of inches long). At this point, I just wanted plenty of width to work with, so they appear quite high in the pictures. 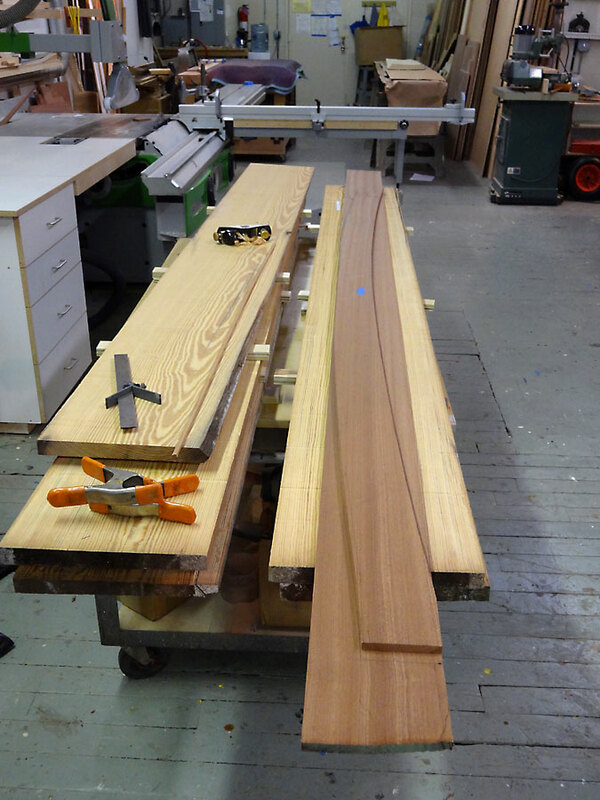 The straight pieces are clamped in, to determine their length. This shows the amount of sheer curve there is to cut. I figured out the correct angle of the end cut on these straight pieces, and made the half lap in one end, checking the fit of the joint on the boat. The first one's easy. 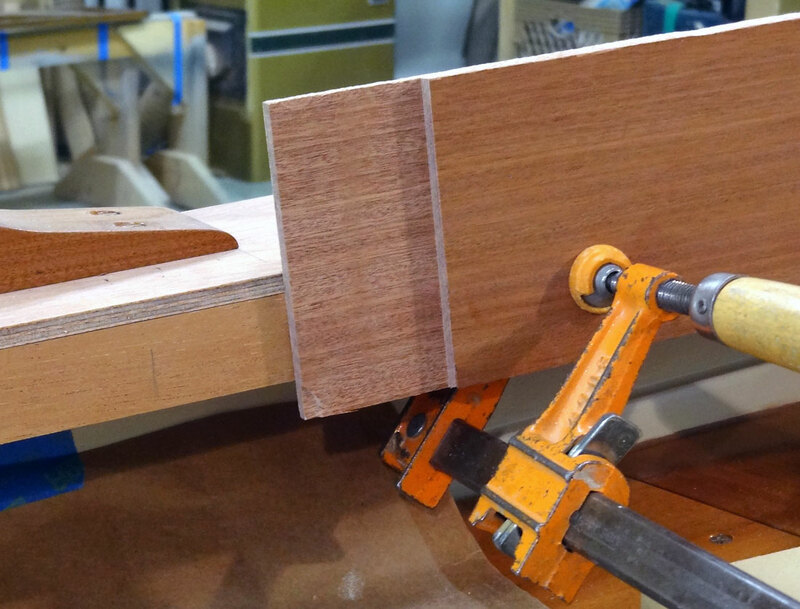 The trick is getting the exact length of the piece figured out, to make the joint at the other end. The piece won't fit until every little bit of curve is clamped into the coaming, and there it gets too short real fast. What I did was transfer a reference mark from the deck to the outside of the coaming piece. I then took a thin scrap of ply and butted it to the join at the other end (with the correct angle cut on the end of this stick), bent it tightly around the carlin, and marked the reference on the ply. I lined up the reference mark from the ply piece to the actual coaming, and marked the end cut (at the proper angle), but I also added 1/8" to the length, hedging my bets. 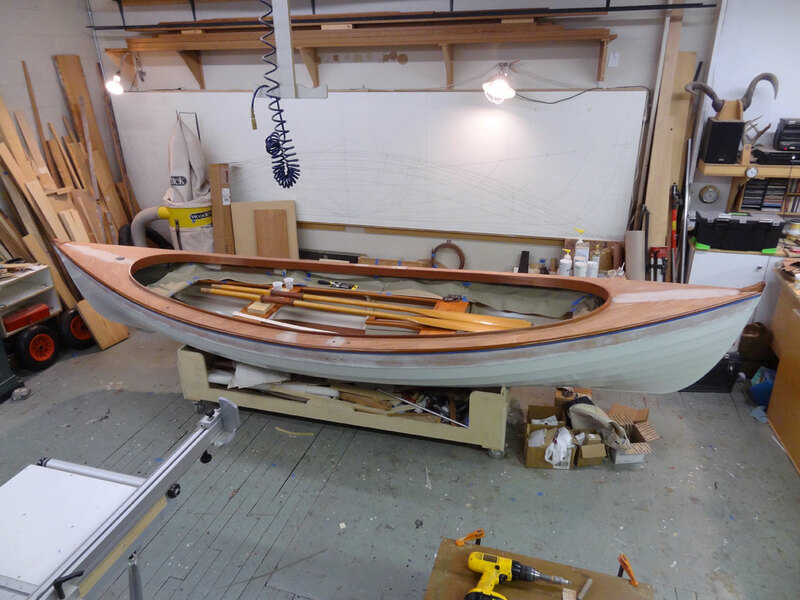 I cut that half lap, and hung the coaming back in the boat. It came out longer than the extra 1/8", but it was fairly easy to mark the correct length the second time, and re-cut the joint. The piece won't fit, as I said before, until every bit of the curve is in the piece. I used a mallet and a block to drive the first end tightly in place, and finally was able to snap the section in. I ended up fussing and tuning these joints quite a bit before I was finally satisfied, though on the next one I was more cavalier in my approach. I will admit to needing a tiny shim on the outboard port side aft, but its matched well, and is not noticeable at all. The half lap fits well. The top and bottom cuts will bring everything to a fair line. With the joints all fitted, I marked out the top and bottom cuts around the entire perimeter of the coaming. I made up a gauge block to find the bottom edge, since this was a constant height below the deck. 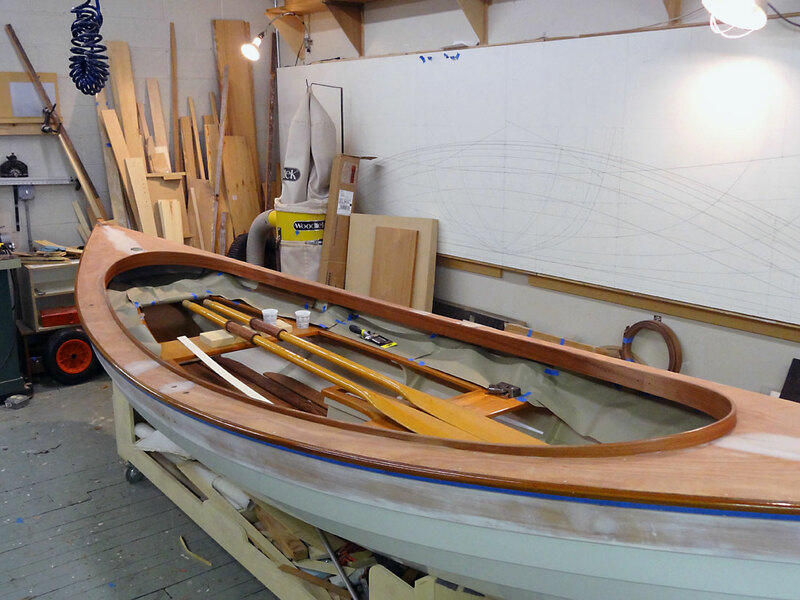 This block has a slot to fit over the coaming, a leg that rides on the deck, and a longer leg that hangs done inside the boat. By running this block all around the boat, the lower edge is marked. I also put a screw reference mark on the jig, to keep the screw heights consistent (the fore and aft spacing of the screws was already marked out). 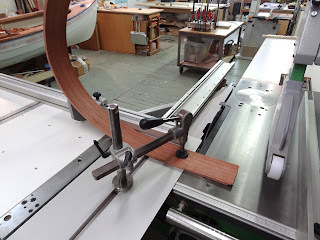 A simple height gauge block to mark the bottom edge of the coaming. The gauge in use. Note the tick mark for screw heights. The top cut was marked with a simpler gauge block that just rode around the deck. 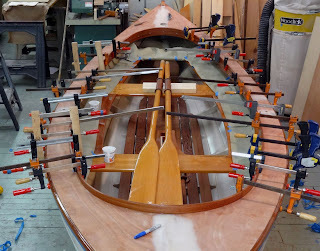 I cut the coaming 3/4" above the deck, no higher than the oarlock pads so as not to interfere with the oars. In the curved ends, I sprung in a little more height to give the deck more shape. The transition is tricky, and I did the best I could. Its not perfect, but it looks pretty good. I then had to pull everything back out of the boat, and cut the top and bottom lines on the four pieces of coaming. I also rounded over all the edges, except right at the half laps, where there would be some final fairing to do after glueing it all in place. One trick I've learned when bonding bright finished pieces with epoxy, is to pre-sand and seal everything with a coat of shellac. 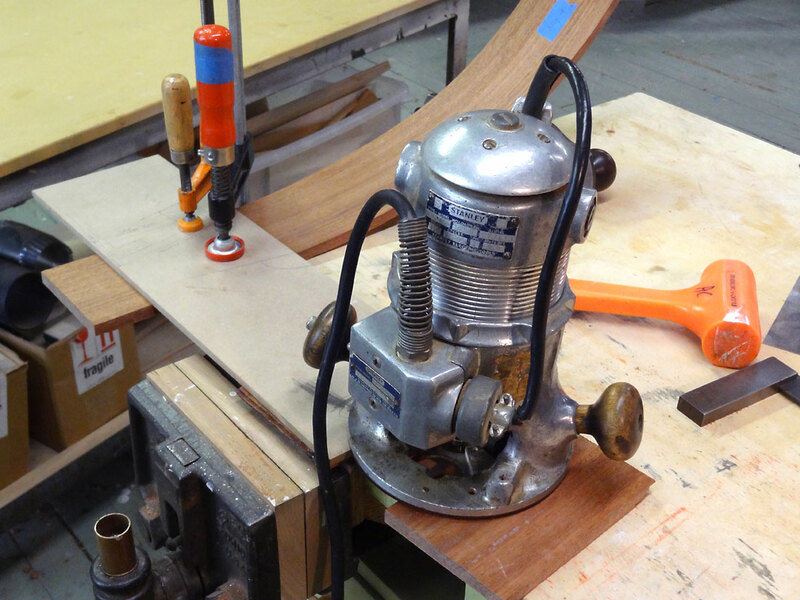 This keeps epoxy off of the wood, and out of the grain, making for a much cleaner installation. I tape off the areas to be bonded of course, before shellacking. I mix my own shellac fresh, using amber flakes and Bekhol, and use about a 2 lb. cut for sealing. The finished coaming parts get a coat of shellac. After shellacking, I pulled off the tape, and reapplied it to mask off the areas around around the glue joint. I also masked off the deck, to keep that as clean as possible, and papered the boat interior as well. I'm a stickler for keeping epoxy off the boat. It pays off in spades down the road. Two of us glued up all the pieces of the coaming in one go. Help was nearly mandatory for this job, springing in and driving all the gluey parts home, then cleaning up the squeeze out. It took us 2-1/2 hours, start to finish. After curing, I faired all the transitions, and that's where we are now. I'm very happy with the grain match between the laminated veneers and the solid sapele stock. All four parts were glued on in one go. The transitions at the laps were faired and sanded. Except for bunging and varnishing, the coamings are done! I still need to bung all the fastener holes, and re-seal the sanded bits and trimmed off bungs before varnishing. I may go ahead and paint the deck next. We're getting closer! For a list of binary option software that are industry leading check out our website http://www.binaryoptionstradinglist.com/.